I want to have a fast lookup based on if two columns are equal. I tried to use a computed column with an index, but SQL Server doesn't seem to use it. If I just use a statically populated bit column with an index, I get the expected index seek. Seems there is some other questions like this out there, but none focused on why an index wouldn't be used. Try with COALESCE instead of ISNULL. 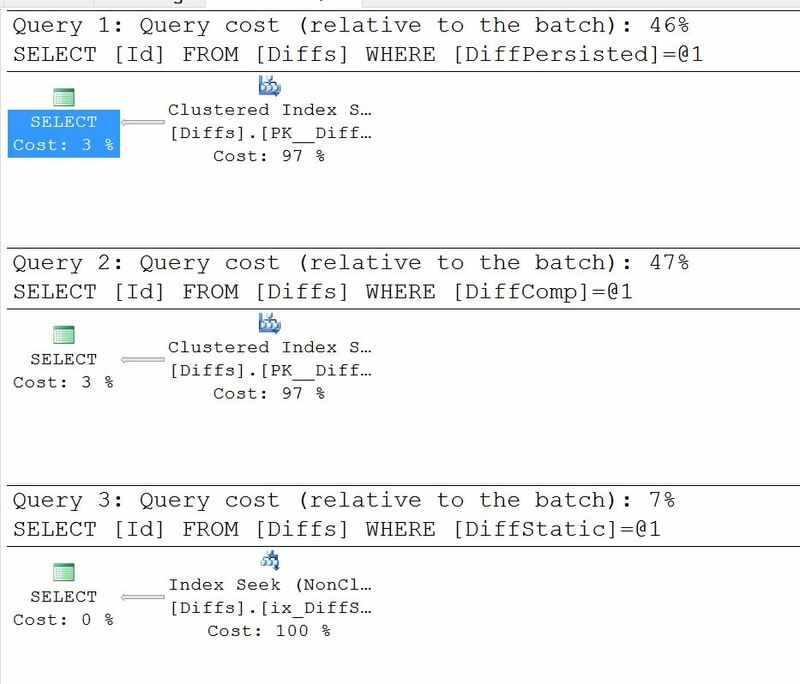 With ISNULL, SQL Server doesn't seem capable of pushing a predicate against the narrower index, and therefore has to scan the clustered to find the information. This is a specific limitation of the SQL Server computed column matching logic, when an outermost ISNULL is used, and the datatype of the column is bit. Do not use an outermost ISNULL (the only way to make a computed column NOT NULL). Do not use the bit data type as the final type of the computed column. Make the computed column PERSISTED and enable trace flag 174. The heart of the issue is that without trace flag 174, all computed column references in a query (even persisted) are always expanded into the underlying definition very early in query compilation. The idea of expansion is that it could enable simplifications and rewrites that can only work on the definition, not on the column name alone. For example, there may be predicates in the query referencing that computed column that could make part of the calculation redundant, or otherwise more constrained. Once early simplifications and rewrites are considered, query compilation attempts to match expressions in the query to computed columns (all computed columns, not only those originally found in the query text). Unchanged computed column expressions match back to the original computed column without issue in most cases. There appears to be a bug when specific to matching an expression of bit type, with an outermost ISNULL. Matching is unsuccessful in this specific case, even where a detailed examination of the internals shows that it should succeed. Not the answer you're looking for? Browse other questions tagged sql-server index-tuning computed-column or ask your own question.